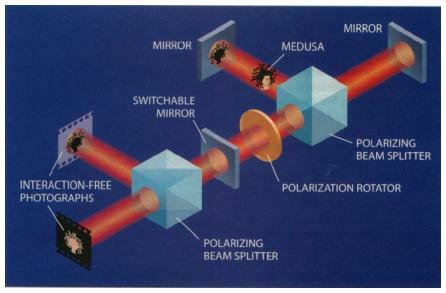 Vision cuantica en la oscuridad - Mediciones "sin interacion"
- Quantum mechanical interaction-free measurement. A.C. Elitzur and L. Vaidman, Foundations of Physics, 23, 987 (1993). arXiv: hep-th/9305002. - Interaction-free measurement. P.G. Kwiat, H. Weinfurter, T. Herzog, A. Zeilinger and M.A. Kasevich, Physical Review Letters, 74, 4763 (1995). - “Interaction-free” imaging. A.G. White, J.R. Mitchell and P.G. 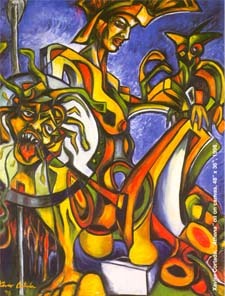 Kwiat, Physical Review A, 58, 605 (1998). arXiv: quant-ph/9803060. - High-efficiency quantum interrogation measurements via the quantum zeno effect. P.G. Kwiat, A.G. White, J.R. Mitchell, O. Nairz, G. Weihs, H. Weinfurter and A. Zeinlinger, Physical Review Letters, 83, 4725 (1999). arXiv: quant-ph/9909083. * Las figuras fueron extraídas de http://www.cortada.com/gallery/virtualexhibits/MEDUSAexhibit.HTM y de Quantum seeing in the dark. Scientific American, November 1996, pág. 52. según el orden de aparición.